Judging by menu cards from the late 1800s, Charlotte Russe was the glamour dessert on fashionable New South Wales’ dining tables. Thanks to the various ‘bake-off’ programs reviving traditional ‘classics’, the Charlotte Russe is certainly a dish worth reviving!Visually impressive, the Charlotte Russe seems like a complicated dish; however, although it is made in several stages, thanks to commercial gelatine products it actually requires little culinary skill. 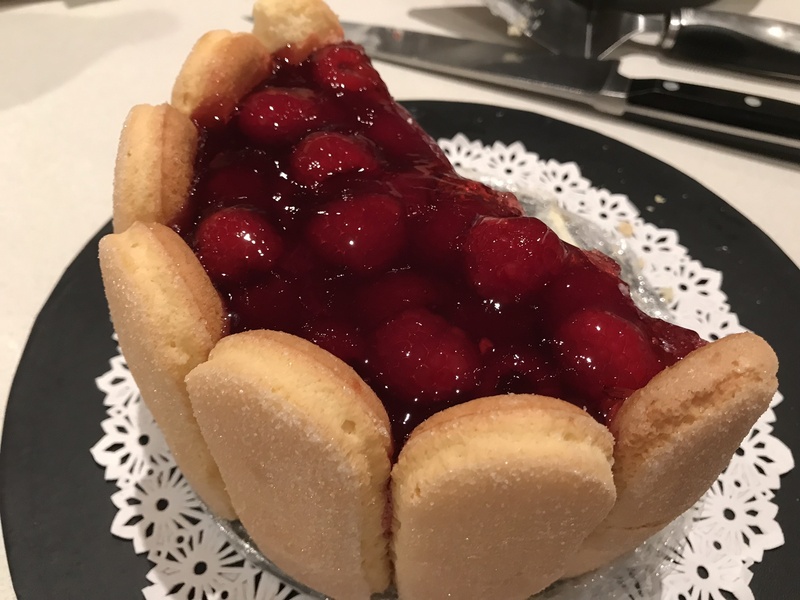 Recipes vary, but essentially they are a sponge cake or finger biscuit crust filled with ‘set cream’, that is, cream or custard set with gelatin or other setting agent, and a clear jelly or fruit topping. Some are open topped, others closed, and some inverted, to give a smooth cake-like finish. I rather like the crown affect that the sponge fingers give. ‘Russe’ in culinary terms means ‘in the Russian style’, or commemorates a Russian identity or historic event. We’ve talked about dining ‘a la Russe’ on many occasions. While there were several Charlottes in the wider Russian royal family at the time of this dessert’s invention, the name may simply relate to the old English ‘charlyt’ – meaning a form of custard. 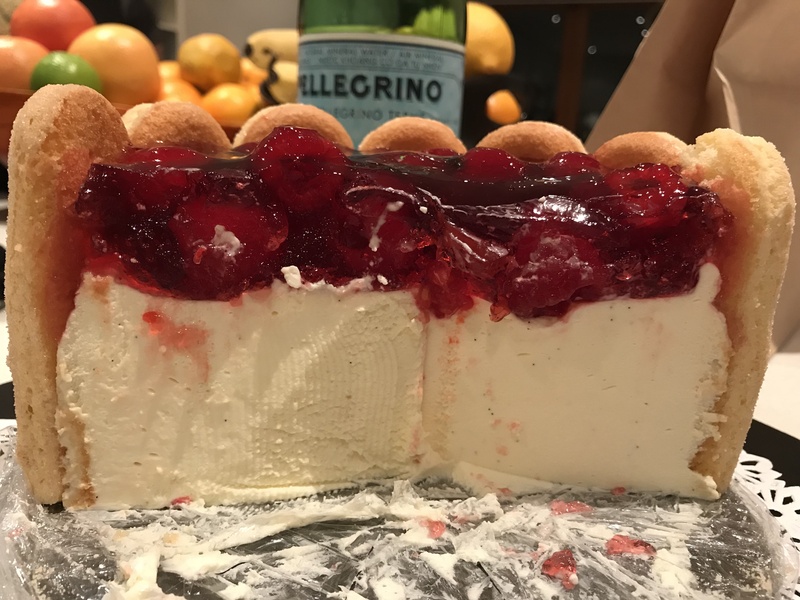 I decided to give one a go, using a more traditional version, with a syllabub-style filling, and preserved cherries set in jelly. My making skills certainly need finessing but I was relatively please with the result, and worth trying to perfect. You’ll notice this one sits a little low in the ‘crown’, so I have increased the volume of cream in the recipe below. As an afterthought, I’d also suggest trimming the bottom curved end off the fingers so that it sits flush with the base. Wide ribbon or d'oyley, to decorate. The Charlotte is made in two stages, the cream layer needing to set before adding the fruit and jelly. If preferred you can make the jelly layer without the fruit, and pile it on top once the jelly has set. Dissolve the plain gelatine in 1/4 cup hot water and allow to cool to room temperature. Once cooled, whip together the cream, sugar and vanilla extract using electric beaters, gradually adding the cooled gelatine liquid and liqueur, if using. Being careful not to over beat whip until the mixture is thick and ribbony and soft peaks begin to form. Line a 20 cm spring-form cake tin with plastic wrap. Arrange the sponge fingers around the inside edge of the tin vertically, standing them as close together as possible. Fill with the cream mixture, pushing it between any gaps between the fingers. Smooth the surface with the back of a spoon and refrigerate for two-three house or until set. Meanwhile, wash the fruit and drain well, or if using preserved or frozen fruit, drain in a colander, saving any juices. Make the coloured jelly according to manufacturers instructions but using three-quarters of the recommended liquid for a firmer set. Replace some of the water in the jelly with juices reserved from the fruit, if any. You should aim to have approximately 800 mls jelly. Set aside to cool but do not refrigerate to set. Once set, arrange the fruit over the set cream in the Charlotte and carefully pour the liquid jelly mixture over the fruit. Don't worry too much if it slips down the sides. Use enough to cover the fruit by a few millimetres, or higher if there is space. Refrigerate until the jelly has set. Alternatively you can make the jelly layer without the fruit, and pile it on top once the jelly has set. To serve Carefully unclip and loosen the cake tin. Transfer the Charlotte onto a serving plate, removing the plastic wrap from underneath. Wrap with a wide ribbon or d'oyley to conceal any messy jelly leakages, and scrape away any that remains visible with a small knife. Slice in wedges as you would a cake, lifting the slice from within the ribbon. What an excellent blog! Why have I only just discovered this? I am going to be working my way through your back catalogue! https://uploads.disquscdn.com/images/e1dc0f32dbb7bceeae2b467bca5d51a403b4ec700a0236ef16df45a0892217be.jpg https://uploads.disquscdn.com/images/5d74f594ed43beb220af17cb64badaa6d1747c2de8c1d9623c48db2d1fce61da.jpg I made this yesterday. Was a hit with the kids & adults alike. Main challenge I had was only having titanium strength sheet gelatin instead of powdered as per recipe. This requires heat to dissolve, however recipe requires the cream to be whipped & heat is the enemy of whipped cream. I solved this by whipping 90% of the cream to firm peaks, whilst I used the final 10% of cream to heat along with the gelatin. Once fully dissolved I cooled to room temperature then folded through whipped cream a few teaspoons at a time. Final consistency was of soft whipped cream & set beautifully. Great recipe, final product looked great & was a hit! That’s wonderful Alison – and delicious pics! We’re delighted to have inspired you to such an extent and thank you so much for the directions for using sheet gelatin. I’m sure other readers will find them useful. The cloth is removed – it’s time for dessert!